A contingency clause is a very important part of a real estate contract, as the contract may become null and void if the conditions of the contingency are not met. There are many different types of contingencies that can be added to a sales contract, including one which addresses the completion of a home inspection. This contingency allows the buyer a certain amount of time to have the home inspected by a professional home inspector. This protects the buyer and real estate agent, as the contract does not become binding until the home goes through the inspection process, and they can negotiate the final contract terms based on the findings of the inspection. It is easy to overlook important aspects when you feel like you’ve found your dream home. That is why it is so important to hire a trained, impartial inspector to find the problem areas you would not have noticed, or even knew to look for in the first place. The inspector will check both inside and outside the home to look for signs of major defects, such as structural damage, or things that might lead to a major defect, such as a bad roof. Any safety hazards will be noted, as well as anything that could hinder the ability to obtain financing or insure the home. Some defects may be insignificant, and the seller is not obligated to repair anything. 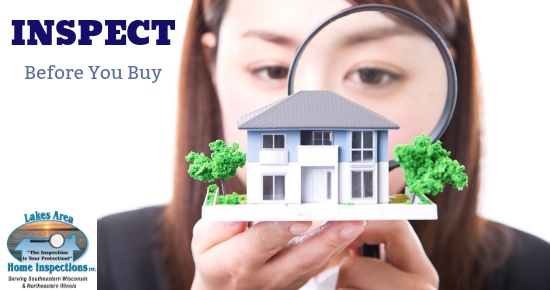 But the buyer can use the findings to determine if the home really is right for them. The home inspection contingency gives the buyer the opportunity to get a complete understanding of the condition of the house before committing, so you should expect a lot from the inspector! They should be certified, experienced, and very customer-oriented. At Lakes Area Home Inspections, our ASHI-certified inspectors will take whatever time is needed to make sure our customers understand our findings, and we’ll take even more time with first-time homebuyers to answer all of their important questions. The inspection is like an insurance policy, and we take that responsibility very seriously at Lakes Area Home Inspections. You need to know exactly what you are buying before signing a binding contract, so you should call upon a trusted inspector to get the job done right. Call us at 262-818-0911 to schedule your appointment today.